A malfunctioning door is one of the most bothersome and common problems that confront homeowners. Proper installation and upkeep is the only way to prevent expensive door repairs and replacements, although a few unavoidable scenarios such as weather changes may result in some minor issues that need immediate action. 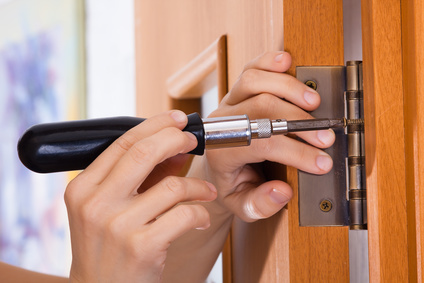 Repair can be cumbersome at times (especially in case of a major problem), and you should consult professionals providing door repairs services in Brisbane or any other city in which you live, to ensure safety and functionality of the door. We list common problems that often arise as a result of weather changes and the right ways to deal with them. Read on. The problem arises due to the weight of the door pulling it down at an angle from the top corner, which is opposite the upper hinge. The result is that the door binds against jamb in that particular corner. Try fixing the problem by replacing one or two screws holding the hinge to the jamb with new ones. Make sure the replacement screws are long enough to reach through the jamb into the stud. If you need to push the door hard to latch it into the strike plate or it just doesn’t stay latched, you need to check how the door is fitting in the jamb. You might need to replace old screws holding the hinge to the jamb or readjust the strike plate. Look at the point where the latch hits the strike plate to figure if the plate should be moved up or down. Put a coating of crayon or use lipstick on the latch and close the door as this will form marks on the strike plate to give an idea of the exact point where it is hitting the latch. Loose or missing screws that hold the hinge pose a threat to the safety of those living in the house. If you see hinges coming out of the jamb or there’s a need to reposition the strike plate, you need to create new holes in the wood for the screws. Drill the old screw holes to size of a standard hardwood dowel, which is 3.8inch, apply glue to the dowel, insert it into the hole, let it dry, and cut it off flush with the surface. You can then drill a new pilot hole and re-insert the screws. Humidity and changes in temperature can cause the door to swell and stick. Sanding down the particular portion responsible for the sticking and friction is the only way to deal with the problem. Slip a piece of carbon paper in the area where you suspect the friction is happening and close the door. The area responsible for the problem will have ink marks when you open the door. Sand the area and seal it up with varnish. A Squeaky door or one that gives you trouble when opening and closing is annoying, especially if you use it several times a day. Any problem with the door will affect its ability to protect the house and its occupants in hot and cold climates. Make sure to inspect all doors in the house before seasonal changes to avoid any problems. AJ Doors can help you with expert inspection of your doors and carrying out all necessary fixes to ensure their functionality is not compromised due to weather changes. We are a trusted provider of window and door installation, maintenance, and repairs in Brisbane and surrounding areas. We have more than three decades of experience as door and window maintenance specialists in Brisbane. To learn more about our residential and commercial door repair and replacement services call us at (07) 3180 2344.